The first two preferences simply determine whether the Explorer List should be automatically refreshed upon saving a new or edited record. Setting these to “Yes” ensures that the list is always up to date. Alternatively, if this is set to “No”, you can manually refresh the list using the available Refresh Button as desired. The third preference allows you to control the number of records that will display in the list. The default setting (BH) displays the maximum number of records per page that will fit based on the current “Browser Height”, without need to scroll. To view additional work orders, the “Next” option is used to retrieve the next page of records. If you prefer to have more records displayed on a single Explorer page, this setting can be changed. For example, changing the preference to “ALL” will result in all records being displayed in a single scrollable page. With this setting, the user simply uses the scroll/arrow control to move on to additional records. These settings can be individually defined for each module, based on your business practice and volume of records. In addition to “BH” and “ALL”, this preference can be set to display a specific number of records per page (e.g. 100). In this example, Format Criteria was used to display all assets with open work orders in red in the Asset Explorer. For more information on this feature, refer to a previous blog post on Work Order Features in MC v6.0. The User Interface Configuration section of the MC User Connect Library also includes a video on setting up Custom Work Order Filters. Last week, we covered the most efficient way to close a work order and this week we will be defining the explorer icons and most commonly used fields. The most important aspect of a work order management system is that it is easy to use and provides valuable reports to help your company save money. Two simple ways to accomplish these goals are a) to clearly understand the system icons and b) streamline the work order process by focusing on key fields during creation/closure. 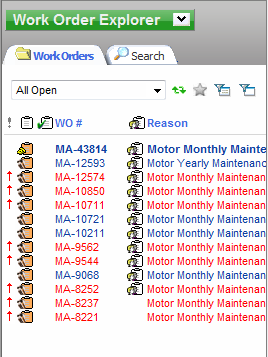 There are several standard icons within the explorer that help users identify the status of work orders and which ones require immediate action. The below screenshot includes the most common icons used in our application in addition to icon definitions. By glancing at the above screenshot, a user can identify quickly that two work orders need to be assigned based on them not showing the white clipboard with heads and that one work order has not been reviewed at all because it is still bold with the telephone icon. They can also decipher that two of the orange clipboard work orders are PMs and are targeted out beyond the rest for completion … meaning they can focus on the unscheduled work orders first. For additional information regarding the WO icons, please refer to the following section of our User Guide : http://www.edemo.us/icons.pdf. The full User Guide is available as searchable HTML or a PDF document within the Maintenance Connection application. Conditional Formatting is a way to set the style of records in the explorer sections of the Maintenance Connection software. This will allow you to quickly identify records that you may need to take action on. Currently, Conditional Formatting can only be used in the Work Order, Asset, Purchase Order, and Inventory modules. In order to set up Conditional Formatting you will need to be logged into the MRO and have the appropriate access group rights. In this example, we will be highlighting certain work orders by setting the text to red when they are set at a High priority. Start by selecting the Preferences option from the Tools dropdown menu. Once the Preferences dialog window is open, ensure that the Work Order module has been selected in the list on the left. The Conditional Formatting can be set to occur for only your specific user or for all members of a specific repair center. For each module that is setup to use conditional formatting, you can set up to three Format Criteria. After saving our preferences and closing the preference dialog we can refresh the Work Order Explore window to see our changes. As you can see, this feature can be extremely useful in identifying and highlighting records in the Maintenance Connection system that need attention. For more information on how to setup Conditional Formatting as well as additional examples of SQL that can be used, please download the Conditional Formatting PDF Tutorial. Join us at the National Facilities Management and Technology Show next Tuesday, Wednesday and Thursday (March 10-12) in Baltimore. Find us at booth #1859. If you’re able to stop by, let us know.